“El jardin de las munecas” (the garden of the dolls) | Hello World! When I am passing by this house on Wright street in Adelaide CBD, I feel afraid and curious at the same time. There are mutilated dolls hanging in the trees in the garden. It is so creepy but I can’t help looking at it each time and wondering why it is here for? What does it mean? Is it the masterpiece of a lunatic? or some garden ornements that I don’t get? I still remember the day when I tried to take a picture of it. Some grating noises started and got louder… and there was no way I could tell for sure if somebody was trying to scare me (and having good fun) or if the house was haunted or something… maybe it was just the wind and the trees were rubbed against the metallic gate… but it did not feel right and I was unable to take a good picture of it! But back to my story or should I say my unsolved mystery… I was so intrigued that I looked on the internet if I could find a ghost story or strange events about Adelaide.. but I could not find anything related to this house facing Whitmore square on Wright street. I had absolutely no leads, no evidences, no clue! So I decided to let it go… Afterall I am not Veronica Mars and I am here to enjoy my time in Adelaide and not try to investigate on some strange dark secrets. I sent the picture to the City newspaper (just in case) and I moved on… both literally and figuratively. I stopped “obsessing” about it and anyway I moved from CBD to North Adelaide …so the creepy house is not on my usual path anymore. I had actually nearly forgotten about it… but a couple of days ago it came back to my mind and it was quite unexpected! I was walking in North Adelaide charming streets, gazing at the birds and the trees when suddenly I have seen this horrible and scaring painting on the pavement leaning on a tree! Four white little kitties standing on a shiny blue sheet: the simple idea of having a painting like that hanging in my living room is already giving me a headache. 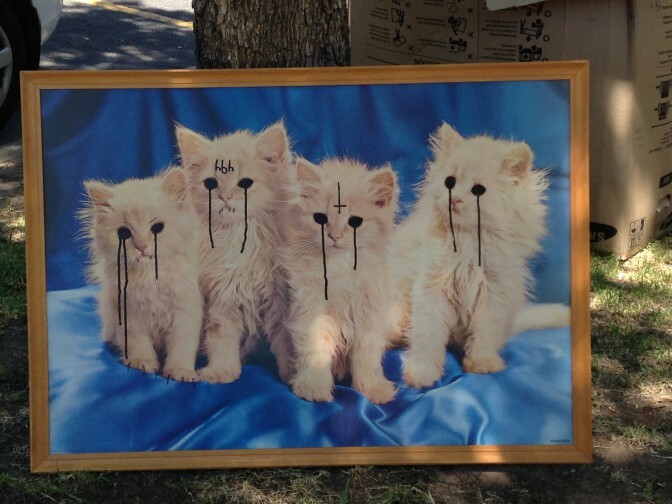 But there was even more scary to come… somebody used a black pencil to blind the cats, like they were crying blood tears or something… they looked like satanic cats… I could not help wondering if the owner of this painting made it himself?! Then you can imagine his wife complained about it so he decided to get rid of the painting in the street hoping somebody would appreciate his sense of home design… Or another scenario is that a simple passer by or a psychopath decided to ruin this kitty scene to spice up its day… You never know, can you?! Don’t worry for me, I still sleep very well at night. And despite these 2 creepy scenes, I still think Adelaide is a charming city… like I said before, there is always something new to discover here and it is impossible to get bored! Previous PostWalk with me…Next Post5 French films to watch with your in-laws!